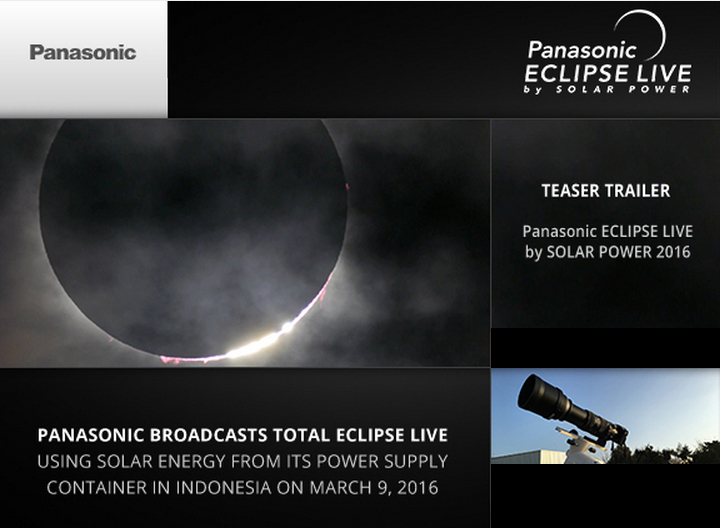 Ternate, Indonesia – February 24, 2016 – As Sumatra, Borneo and Sulawesi plunge into darkness during a rare total solar eclipse on the morning of March 9, 2016, Panasonic delivered a live broadcast of the approximately 4-minute-long phenomenon from Ternate, an island in eastern Indonesia, using its Power Supply Container, a stand-alone photovoltaic power package. To enable live filming and broadcast from the island, the Power Supply Container will be transported from Jakarta to Dodoku Ali of Ternate. 12 Panasonic HIT solar modules with high conversion efficiency will generate approximately 3kW of electricity by tapping renewable energy from the top of the container, and store the power in 24 built-in lead-acid storage batteries. The stored energy will be supplied to a Panasonic LUMIX GH4 camera attached to a telescope to capture the spectacular moment. Mobile computers, production and editing equipment, internet connection and other supporting technology will also be powered by solar energy. The live broadcast of the solar eclipse will begin at 05:00 AM, March 9 in Ternate (08:00 PM, March 8 UTC) and can be viewed on platforms including Ustream, YouTube Live and Periscope. This was the third time Panasonic is broadcasting a solar eclipse live. Unlike previous occasions where time and effort had to be spent setting up HIT solar modules on the ground, the process is significantly more convenient this time round due to the portability of the Power Supply Container and its capability to be assembled quickly and easily with minimal construction work. Prior to this live broadcast project in Ternate, Panasonic has developed and introduced the Power Supply Container to other parts of Indonesia. The first container was installed in July 2014 at the National Elementary School Karimunjawa 01 located on a remote island of Indonesia to improve the educational environment for students and teachers. Following its success, a second container was introduced in July 2015 at another elementary school in the mountainous region of West Java Provinceto enhance both study and water supply conditions. Panasonic strives to extend this technology to other areas without electricity to provide stable power supply and mitigate social challenges towards a better life and a better world. Next : Microsoft Dynamics AX Now Available In 137 Markets!